Strawberries, bananas, caramels, coconut balls -- just about anything you can imagine becomes sweeter when you dip it in chocolate. Sometimes after storage, dipping chocolate that was once glossy and enticing develops a white to gray coating that looks anything but appetizing. This coating, known as bloom, develops when moisture comes in contact with the chocolate or when the fats in the chocolate separate from the cocoa. Fortunately for the chocolate connoisseur, both scenarios are preventable. Store dipping chocolate in a cool, dark place where the humidity level does not exceed 50 percent. Ideal temperatures in the storage area should average between 60 and 69 degrees Fahrenheit. Allow dipping chocolate that has been stored in the refrigerator or freezer to come to room temperature before removing it from its wrappings. Cold chocolate that comes in contact with the open air forms condensation, resulting in sugar bloom. Temper the dipping chocolate before using it. Heat the chocolate in a double boiler over low heat. Stir constantly with a wooden spoon, removing the pan from the heat when the chocolate begins to melt. Add some unmelted chocolate to the heated chocolate, attach a candy thermometer to the double boiler and let the chocolate cool to 80 degrees Fahrenheit. Set the double boiler back on low heat, stirring until the chocolate reaches 90 degrees Fahrenheit. Fat bloom is most likely to form on dipping chocolate stored in temperatures between 70 and 75 degrees Fahrenheit. 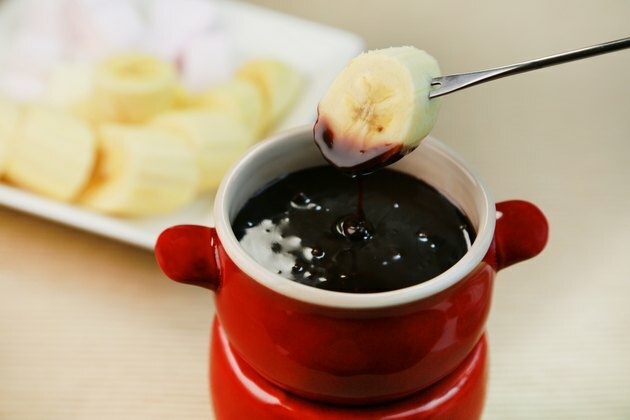 It is not harmful to eat dipping chocolate affected by sugar or fat bloom. Is Chocolate Good for Helping Diarrhea?